Hate Your CPAP? Here's Your Solution! Annoying, bulky, and restrictive, no one 'loves' their CPAP. Now is the time to get rid of it. Know and understand the full health impacts of Obstructed Sleep Apnea if untreated. For many, a simple good night's rest is all they're after, and with our non-surgical treatment options, YOU CAN SLEEP BETTER! 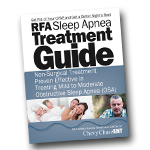 Understanding your sleep apnea treatment options. As an Obstructive Sleep Apnea (OSA) sufferer, you know the risks of OSA, and if you’re using a CPAP device you also know how uncomfortable, claustrophobic, and irritating they are to wear every night while you’re trying to sleep—not to mention the hassle of lugging it around while traveling. Fortunately, there’s a non-surgical treatment option that has been proven effective in treating mild to moderate cases of OSA for sleep apnea sufferers. RFA is a simple, painless, non-surgical treatment procedure that uses radio wave energy to shrink the tissue at the back of the tongue that blocks your airway and causes OSA. Relieves the potential for airway blockage that causes the snoring, breathing disruption, and lack of a good night’s sleep that are associated with untreated OSA. Patients suffering from mild to moderate OSA can often get rid of their CPAP masks forever. In some cases, and especially with more severe OSA, the treatment can make using a CPAP mask more tolerable, due to lower air pressure settings required after the procedure. MySleepApneaMD.com is provided by Chevy Chase ENT, a private medical practice conveniently located in Chevy Chase, Maryland specialized in the treatment of sleep apnea and Ear, Nose and Throat issues. We serve patients and referring physicians throughout suburban Maryland, Washington, D.C., Northern Virginia, and the surrounding metropolitan area. We care for children and adults of all ages. Please feel free to contact us to ask a question or schedule a consultation, or call our local help line at (301) 200-1500 and we will be happy to answer your questions.